It's been 20 years of learning and teaching many forms of Energy Medicine and preventative health! 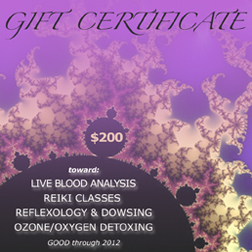 In addition to teaching Reiki, Dowsing, EFT and Reflexology classes, I practice and teach nutritional microscopy / live blood analysis and offer ozone / oxygen therapies. Most of this occurs at my healing studio at 107 - 2096 West 41st Avenue, Vancouver, BC. 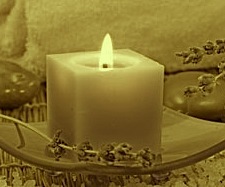 I was introduced to Reiki, Reflexology and Dowsing in the late 1990's. After exploring many methods of self-awareness training, taking a plethora of energy work, body/mind, alternative healing classes, I knew I had finally found, amongst these varied and often awesomely inspiring and wondrous modalities, the key elements that were integral to healing the way I wanted to integrate and present them. (These included Touch for Health™ - Levels 1-4; BodyTalk - Modules 1-3; Brain Gym™; Quantum Touch - Levels 1-3; German New Medicine™ - all levels; Isopathic Homeopathy; Jin Shin Jyitsu™; One Brain™; Neural Linguistic Programming™, Emotional Freedom Technique™; Feng Shui - Compass and Black Hat schools). I am currently pursuing a PhD in metaphysics. In my youth I completed Lyceum in The Netherlands and then came to study Fine Arts and Architecture at UBC in Vancouver, BC. More recently I was the publisher and editor of The Healing Journal, a bi-monthly wholistic health magazine in hardcopy from 2003 thru 2008 and on-line till 2014. The Healing Journal was founded to provide clear honest information - to help level the alternative, health and healing playing fields and to cut through so much false information mostly well-disguised advertorials. The content ranged from the physical, environmental to the metaphysical, spiritual and from the obscure to the political. Many fine teachers have patiently inspired me - Eric Dowsett, Richard Gordon, Alain Herriot, Dr. Martine Faure-Alderson and others, to continue with this work. Sometimes my clients have unwittingly inspired me when they showed what profound changes and shifts they could make with a little facilitation. They are a testament to open-minded strength, dedication and resilience to the best they can be. Have you looked at a lot of classes and workshops and don't know which to sign up for? Wonder how Reiki and Reflexology and Dowsing can be taught in a few hours by some and yet Pacific Holistic takes a whole weekend for a class and for each level? Give me a call with any questions you may have and I will be happy to explain our class and content. What do you have to loose? Gift certiciates available - by email, snail mail and special delivery - any denomination that works for you - just the right gift for someone you love and what a surprise!